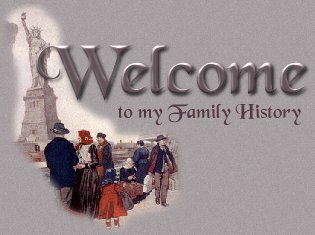 This site is dedicated to my family, past and present and consists of family history, photographs and other historical items. On my father's side, my direct ancestors are: Adams, Anderson, Brown, Clark, Cleland, Collins, Davie, Fischgens, Hart, Hayes, Henderson, Houlston, Jarman, Maris, Mayne, McNamee, Mitchell, O'Hara, Shipley, Tatnall, Taylor, Watson, Willsmith, Woolslayer. On my mother's side, my direct ancestors are: Bentham, Boone, Brice, Caine, Eberhart, Elliott, Everett, Geyer, Graesel, Greenwood, Griffith, Gundelach/Gundelachin, Heaton, Henderson, Hickman, Hollenberger, Howson, Johnson/Johnston, Jones, Karcher, Kieswetter, Kramer, Langstroth/Longstreth/Longstreath, Pride, Reppert, Rumble, Sapp, Southard, Steele, Stenger, Stewart, Stone, Voltz, Wentzel and Wright. I am also researching my daughter's paternal ancestors: Arvai, Danker, Ermlich, Grasley, Kipkin, Levay/Levoy, Lutsko, Papp, Rinyu, Schrader, Tishler, Von Rosenbroke and Weber. Some of the collateral lines are: Basalyga, Cain, Cannon, Davis, Doty, Erwin, Herrington, McFarland, Mentzer, Nunn, Peret, Wheeler, Wilson. This is a work in progress and changes on a regular basis, check back for updates. Some lines I have considerable information and documentation, some very little.